The moon mandala is highly symbolic. In Buddhism, Buddha sits on it. In Native American culture, different elements are added to reflect a person’s traits based on their birthday. A moon mandala can also represent various situations and desires based on the moon phase depicted in the image. Whether you’re looking for new art, jewelry, a tattoo or a meditative aid, there is a moon mandala just for you. The moon mandala is a significant symbol in Buddhism. It is the symbol of bodhichitta which means “mind of enlightenment.” The origin of the word bodhichitta is Sanskrit. “Bodhi” means “enlightenment” and “chitta” means mind. Mandala is the Sanskrit word for circle. A moon mandala or bodhichitta represents one of the three principal paths in Buddhism – renunciation, bodhichitta and voidness. Renunciation is represented by the lotus and voidness is represented by the sun. Buddhas are usually depicted sitting on top of the three representations. If you look closely at Buddha figures, you will see many of them sitting on the lotus with the moon disc or pillow beneath the lotus and the sun beneath that. When they have separate colors, the moon should be white and the sun should be red. The full moon represents abundance, achieving your dreams and desires, harvest, protection and sexuality. The new moon represents faith, hope and new beginnings. A waxing moon symbolizes a time of learning and growth, creativity, accomplishments, building and positive transformation in general. A waning moon represents clearing away the old to make way for the new. A moon mandala that includes the wolf symbolizes January or the wolf moon sign. The moon with snow symbolizes February or the snow moon sign. A crow on a moon mandala represents the crow moon sign or March. The seed moon sign is the symbol for those born in April. It is depicted with three pine cones and pine tree branches on a moon. May is represented by the flower moon sign which is depicted with sunflowers on a moon. The strawberry moon is the symbol for those born in June. Strawberries would be included in this moon mandala design. July is the month of the thunder moon sign. A moon mandala for this month would include clouds, rain and a thunder bolt. The sturgeon moon represents people born in August. Several fish would be included in the sturgeon moon mandala design. A harvest moon mandala is the symbol for those born in September. This mandala would include a depiction of wheat. October is represented by the hunters moon. A hunters moon mandala would include a bow and arrow. A beaver moon is the symbol for people born in November. The cold moon sign represents those born in December. 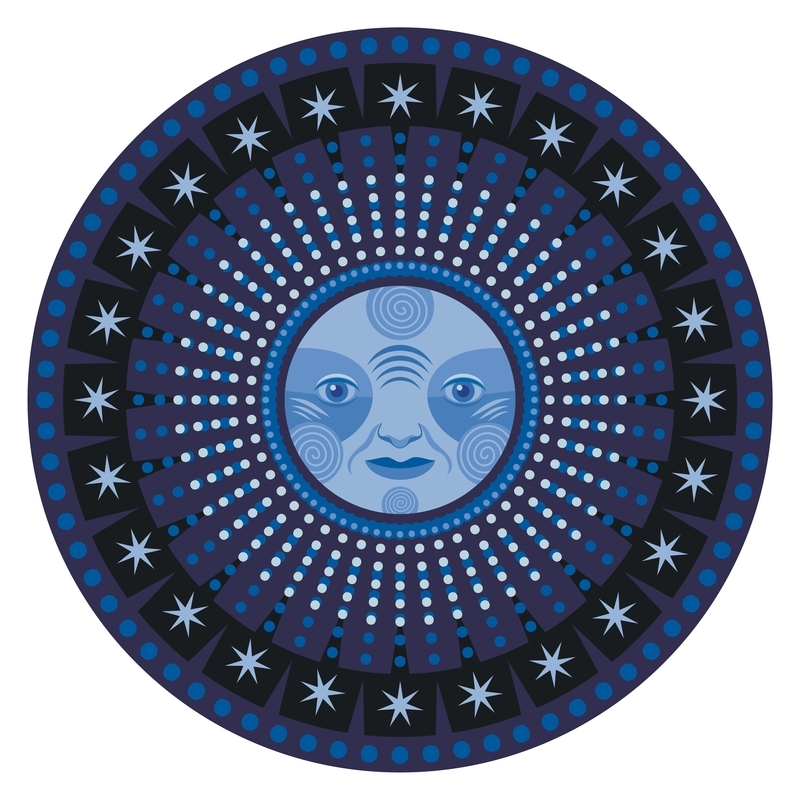 A cold moon mandala design would include dark snow clouds and snow flakes. Moon mandala art and jewelry are a great form of self-expression. Jewelry and art can include all phases of the moon and any combination of colors. Half-moon mandalas and crescent-moon mandalas make lovely earrings and necklaces. They can be worn to support a goal or phase that you may be going through like a time of new beginnings or a desire to let go of the past. Mandalas are meditation aids. Moon mandala art and jewelry can help you reach a meditative state and help guide your focus in a particular direction. If you are focusing letting go of an old relationship or issues, go with a dark shaded full moon. When you are meditating on a new beginning, use a bright white full moon. Moon mandalas in various colors will assist with clearing and balancing your chakras during meditation, as will moon mandala jewelry made with certain crystals. Violet and white help clear and balance the crown chakra, which is located on the top of your head. Moon Mandala earrings made with ametrine or sugilite work well in this area. Purple and indigo work with the Third Eye Chakra. Earrings made with amethyst or tanzanite are ideal for working with this chakra. Blue is the color for the throat chakra. Earrings or a necklace made with lapis lazuli or blue lace agate will help clear and balance this chakra. A moon mandala tapestry adds beauty to the room and serves as a focal point for meditation. Many of them are sun/moon mandalas but a tapestry depicting just the moon or the moon in different phases can be found. Moon mandala coloring is highly therapeutic and can be fun. It is a great way to express yourself in a creative way. Coloring pages are available on-line but, if you have a compass or even a small drinking glass, you can easily make your own coloring pages. The main thing with moon mandala patterns is circles so really anything that you can use to make an image of a moon by tracing a circle will work. If you want half or crescent moons, just slide the circular object over slightly and draw another line. Get creative with colors and include other elements in the images. Use different moon phases and/or include your Native American moon sign. Moon mandala tattoos can be a fairly basic design or as individual as you are. The patterns can be as intricate or simple as you like. Moon mandala tattoos are often designed to reflect your spiritual or religious beliefs. All mandala tattoos generally go best on a large, flat part of the body like the back or chest. Moon mandala tattoos, however, especially crescent- or half-moon mandala images, can be put anywhere. 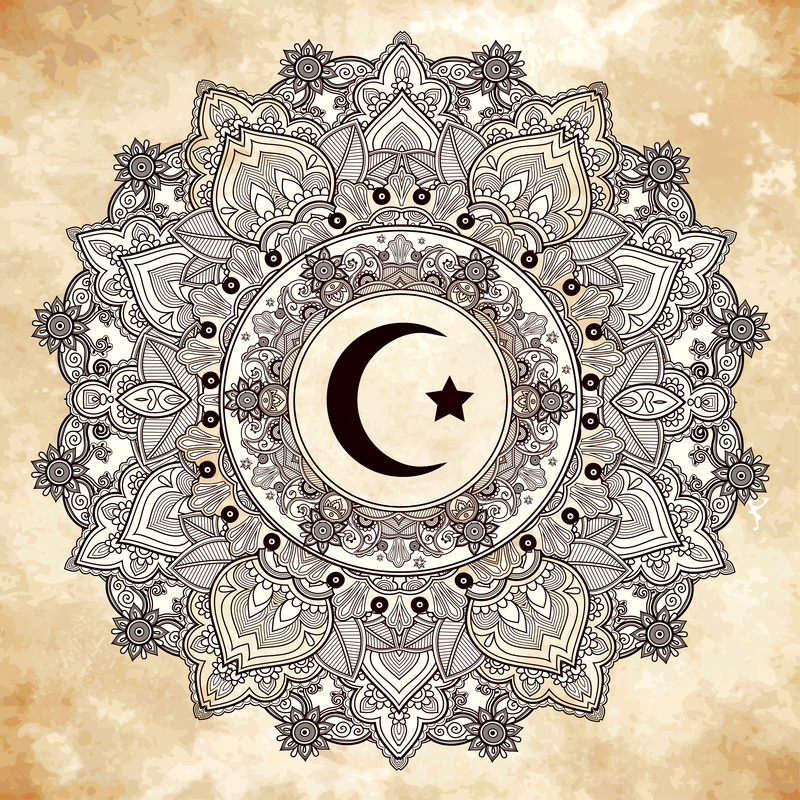 Larger full-moon mandalas would have to wrap around the sides of an arm or leg while smaller full-moon mandalas look good on a shoulder or upper part of the arm or leg.